The most private place in your home is being invaded by cameras, sensors and virtual assistants. Getting up from the toilet after a satisfying bowel movement, you walk right over to the sink and start washing your hands. "Alexa, flush my toilet," you say while reaching for your toothbrush. Your mirror starts displaying your schedule for the day, the weather update and the latest news. Suddenly there's a ping -- your toilet has detected an anomaly in your stool and recommends you increase your fiber intake. A dispenser built into your medicine cabinet whirs to life and spits out a fiber supplement. The futuristic bathroom I just described isn't that far away from becoming reality. In fact, at CES 2018, Kohler unveiled a new addition to its toilets and shower devices that let you ask Amazon's Alexa to assist you. Moen also added Alexa support to its smart shower line, promising Siri compatibility is on its way. Smart mirrors that tell you your daily agenda while assessing your complexion have already been available for months too. It's a little strange to tell someone to flush your toilet for you -- it feels oddly intimate, if not simply lazy. But there are benefits to having such an option. Germophobes can avoid touching surfaces potentially covered in bacteria, while those who have limited use of their hands due to injury or disability have a convenient alternative. Of course, there are other hands-free methods for flushing, like motion sensors or foot flushes. So having a conversation with your toilet just feels unnecessary. That's why Kohler is less interested in you talking to your bath fixtures than it is in taking advantage of Alexa's tendrils snaking throughout your home. For example, you could ask an Echo in your kitchen to run a bath while you finish the dishes. The new Perfect Fill Tub would then automatically turn the faucet on, adjust the temperature to your preference and turn off when the water was just right. When you're washing up the dishes after dinner, you can tell Alexa to get your bath ready so you don't have to actually go turn on the tap and monitor the water temperature yourself. Moen, on the other hand, provides Alexa as a complement to its existing U by Moen connected bathroom system, which is mostly controlled by an in-shower panel. Using the voice assistant in the shower would be tricky, since the sound of water spraying all over could potentially confuse Alexa. Smart home companies believe there's plenty of room for more technology in the toilet. Abbie Byrom, director of global partnerships at Samsung SmartThings, said there is potential for the bathroom to be a way to glean insights into a person's health. Future toilets could tell if a woman is pregnant, not only saving her a possibly embarrassing run to the pharmacy but also alerting the more oblivious to their situation. But the idea of a toilet that analyzes and potentially collects information on your waste feels even more invasive than a voice-controlled flush. Although it's not meant to replace a visit to your doctor, there are still myriad concerns around privacy and accuracy that make it unlikely that we'll see a poop-analyzing toilet anytime soon. Not only would companies have to ensure compliance with HIPAA guidelines that protect a person's medical data from being shared with others; they would also have to defend their networks and servers against exploits that could leak this sensitive data to the public. Plus, each new device you introduce presents another potential access point for anyone trying to harvest your data, whether it's the smart mirror's camera that scans your face or the radio that sends your data from your bathroom scale to your phone. Byrom also suggested that there could be connected medicine dispensers in the bathroom that remind the elderly (or just plain forgetful) to take their pills. Again, smart pill bottles that ping you to take your medicine already exist, but if this technology is already built into your medicine cabinet, it saves you the trouble of having to buy another device. The good news is, major companies in both the smart home and toilet industries agree it's important to respect the sanctity of the bathroom, where we are at our most exposed and vulnerable. "It's a place where we begin and end our day. It's such a personal space," said Tony Hang, district sales manager for Toto. 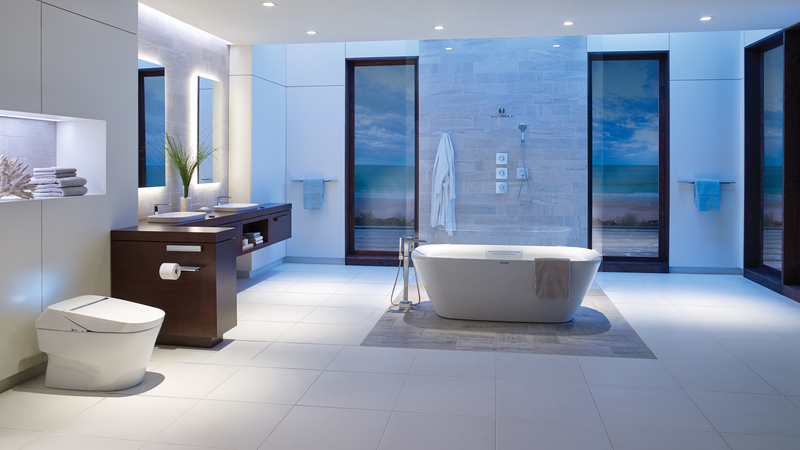 The challenge, then, is to make sure that the push of smart home technology into the bathroom isn't just about adding technology for technology's sake. Instead, it's imperative that companies be thoughtful about how and why these features are being implemented. For now, it's clear that the industry is just dipping its toes into digitizing our bathrooms, but it's likely to dive in deeper soon.